Welcome to the website for our luxurious and stylish holiday apartment near Paralimni and Protaras in south-east Cyprus. It has 3 bedrooms on the top floor of a small development in a quiet location. It features a large south-east facing balcony overlooking the pool and sun patio area. Available to rent all year round, this is the perfect location for your next holiday in the sun. Please browse our site to see details of the property, photos and info about the surrounding area. You book directly with the owners. We do everything we can to ensure you have a fantastic holiday as our guests. Do email us for more information or with any questions you have, from the 'Contact Us' page. For many it is because of the summer sun, fine and clean beaches and wonderful scenary. But Cyprus is also a great location for a winter sun holiday. From November to February the days are likely to be warm, often hot, and sunny with just the rare rainy day. Nights are cool, sometimes cold but the apartment has heating and winter bedding. The beatiful beaches will be almost deserted, and the many historic places and museums will have few tourists. Cyprus out of high season is great for cyclists and walkers. The roads are quiet, and the coast paths delightful. Our location near Paralimni is also perfect for your vacation. The town is the regional capital, and most restaurants and shops are open outside of the tourist season. Yet it is a short drive from some of best beaches and locations on the coast and parking is easy. Our apartment is very near the border crossing with North Cyprus, giving easy access to Famagusta and the ancient port of Salamis. The southern coastal path starts near our apartment and reaches Ayia Napa. It is bustling in the summer, with many kiosks open to serve visitors. But out of season it is peaceful and almost deserted. It is popular with walkers and cyclists, and for just relaxing and enjoying the varied scenery. During spring, the coast path is a carpet of flowers. 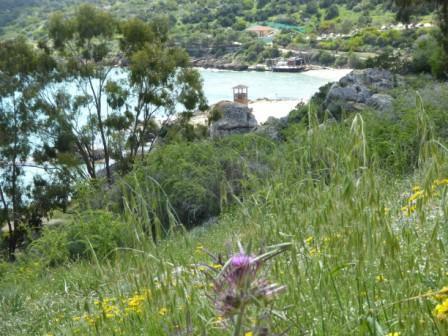 This photo looks towards Konnos Bay from the cliff path. 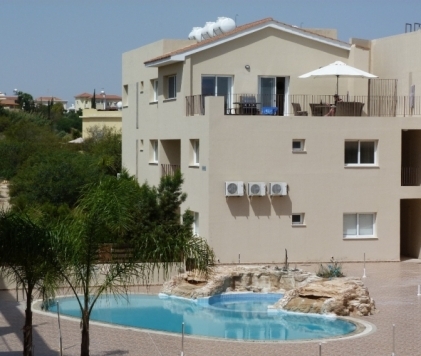 See our Cyprus page for information about the location of our apartment. Please see our calender for current availability.